Last September, two of my favourite people got married. 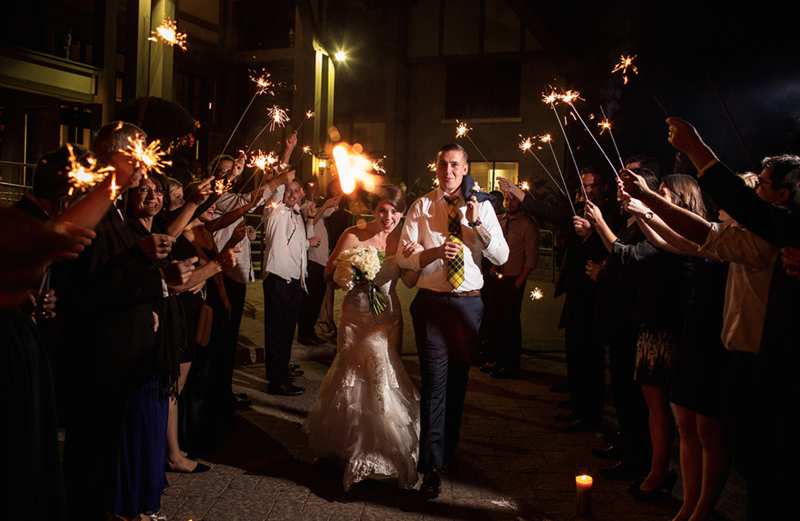 The wedding was seriously so much fun, and Stephanie thought through every little detail, to make the day memorable for her guests, and for her and her new husband Josh. Thankfully, she and Josh let me be part of their day, in more ways that one! Not only was I their calligrapher/everything-paper-designer, but I got to be a bridesmaid too! It was so much fun, since my husband Josh was a groomsman. Stephanie and Josh chose a stunning colour palette. I mean, look at those deep green dresses! The boys looked soooo handsome in their suits, but I was pumped on our dresses. I thought we were all total babes. But honestly, Steph stole the show. We pulled that deep green into her invites, and added little bit of Stephanie signature (polka dots and gold!) and she let me bring in my own ideas to the pieces (watercolour washes!). Below are the invitation suites I created, under Steph's watchful eye. She has a great eye for design, so I didn't mind any of her input at all. Alongside the invitation, Stephanie asked me to create some wedding signage to be used throughout the day. She had curated the perfect Pinterest board, and pulled different ideas of little quotes she's loved, and directed me to create these pieces, which look stunning in the vintage gold frames she had. The menu that Josh and Stephanie picked out was DELICIOUS. I was lucky enough to have a sneak peek at what we were going to be served while I was making the menu for everyone's seats. I also created a little card which dictated the rules to follow in order to get the couple to kiss (I sang Kiss the Girl, from the Little Mermaid, accompanied by the cutest little girls). I really enjoyed the touch of donating money in lieu of favours to organizations that were close to both Josh and Stephanie's hearts. I think that favours are sometimes so useless, and this option is so much more meaningful. It was such a pleasure creating this whole suite for Stephanie and Josh. It was even more of a pleasure getting to be there in person, and see it all put to use! I'm so glad that these two are married, and I am fortunate to call them my friends. They are both so special to me, and I can't wait for many more years of friendship to come! See more of Stephanie and Josh's wedding on the EventSource.ca blog! They were featured, and that's exciting! Today I want to share a set of wedding vows that I did this month for a custom order. And I have to be frank with you. This piece was HARD. I was working much larger than I ever have before for a calligraphy piece. Including lots and lots of words, plus the lines for their adult witnesses to sign, getting everything lined up nicely was tough. There were many rough drafts, trying to get everything lined up properly, spaced properly, and looking nice. On top of that, I had to make sure to not make any mistakes while inking the final piece. After all was said and done, rather, written and done, I got to the fun part, painting that floral border. The bride, Janelle, had given me a colour palette filled with beautiful purples and blues, and some ideas of the kind of vine and floral border she wanted. I'm pretty happy with how it turned out! Whimsical and not too over the top. Wishing Janelle and Matthew all the best on their wedding this weekend! I hope that the weather is beautiful, and that you have fun with all your family and friends!